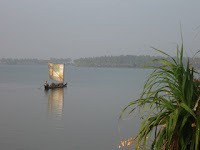 Woke up early in the morning to catch the Kollam – Trivandrum Passenger at 6.45am. 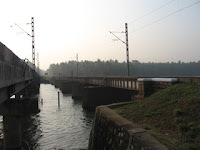 Got down two stations later at Paravur, which is 13km from Kollam. Walked along the tracks and got to the lake. 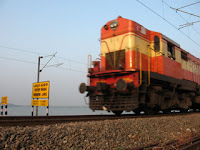 Clicked snaps of 2 passing trains, especially one on the bridge, which is less than a km away from the station. Spent more than an hour sitting on the girder of the bridge listening to music, watching an occasional boat drift by and sun rise higher into the sky. Enjoyed the solitude that came with a cool breeze. Discovered the multi-faceted uses of the bridge – which is used by the locals to fish, perform morning exercises, or sit and chitchat. One cheeky individual seemed to derive immense pleasure by crapping under the bridge. On seeing me with the camera must have wondered if I was going to take his snap! Walked back along the tracks for the 1082 Kanyakumari – Mumbai Jayanti Janatha Express that was to take me back to Kollam. 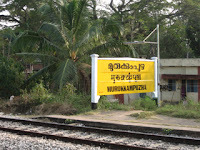 Got back to Paravur, just as the Kanyakumari bound 1081 Mumbai Express thundered past, followed by the Madurai – Kollam passenger which pulled into Paravur and waited for the 1082 to cross it. This was followed by the 7229 Hyderabad bound Sabari Express overtaking a late running 1082. 1082 soon chugged in and hordes of college-goers and office workers from Paravur as well as the Madurai – Kollam passenger got into the train. Got into a jam-packed general compartment, the second from the engine. Couldn’t take snaps, but managed to record a sound clipping of the decked up, freshly painted Erode WDM2 beast with its double horns bleating incessantly and kicking up a storm on its ride. 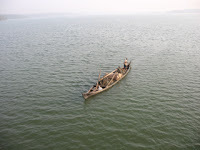 Got to Kollam around 9.30am. Ran into vava and her grand mum at the railway station, waiting for Nethravathi Express. Had to go to Trivandrum in the afternoon to visit a friend’s family. Opted for the Kottayam – Nagercoil passenger than the KSRTC super fast bus. Clicked snaps like crazy. Watched this crazy dude dangle out of the train and try acrobatics like crazy. Got into Trivandrum Central around 5.30. Took off to Sree Padmanabhaswamy Temple, Aatukal. Visited friend’s family, loved the ripe banana chips they got me. Headed off to Karalkada, a famous shop that sells traditional Kerala silk dhotis (mundu) and sarees. Ran into Shaji Kailas, a top Malayalam director and his actress wife Annie. Wondered how easy it is to spot celebs in Kerala. Just a few days ago, we had raced N.K Premachandran, Kerala’s water resources minister in Kollam on our bike. On 31st, the railway minister Laloo Prasad Yadav was in Trivandrum to commission the electrified Trivandrum – Ernakulam railway line. Wanted to go and click snaps, but got stuck in Ernakukam. Boarded the 6347 Trivandrum – Mangalore Express at 7.45pm to get back to Kollam. We were getting really late for our train so we jumped into a train that was just starting to move in an opposite direction so that we could get to platform 3 where Mangalore Express was waiting. Though we did that quite coolly then, now I wonder how the hell we could do something risky as that. Mangalore Express was jam-packed. Decided to get sleeper tickets up to Kollam. Paid 200 Rs which was swallowed entirely by the TTEs. No receipt, no ticket. Corruption rules? Got down at Kollam, where the train got delayed owing to the massive crowd that hung out of the general compartments. It got so crowded that a group of passengers wanted to travel in the guard’s cabin, sensing the weird situation the guard locked himself up in the cabin, before reporting to the station that it was impossible to start the train with such a huge crowd. An absolute nightmare! Type ‘Kerala’ or ‘trains’ in the ‘search tags’ field in the top right corner and click ‘Go’.